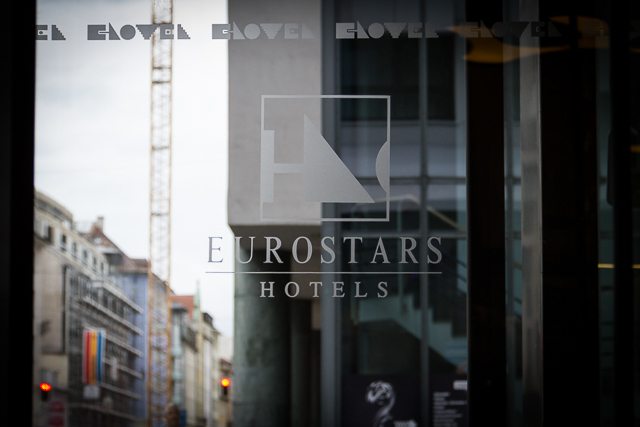 The Eurostar Book Hotel, Munich, Germany | Should We Go There? 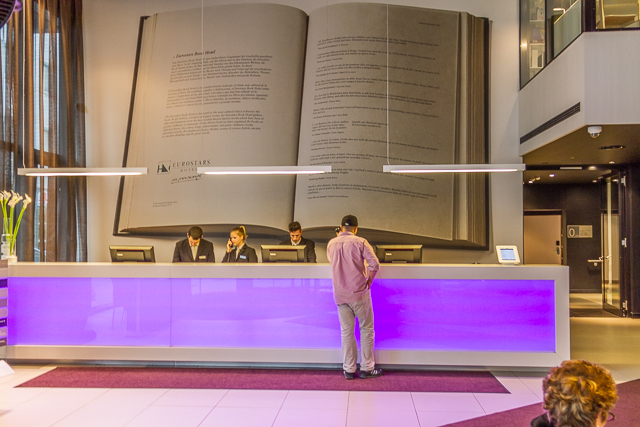 The Eurostar Book Hotel, Munich is in a very interesting building. It appears to be part of an older building that has been completely remodeled into a new, modern, sleek design. 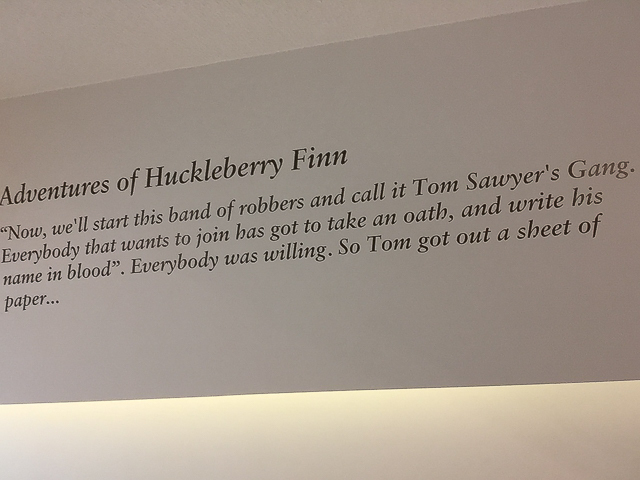 You could tell immediately that the theme of the hotel is a literary one, because of the large book hanging on the wall behind the reception desk. The lobby is very open with plenty of seating, and is combined with the lobby bar. The restaurant is just past the lobby bar and has a permanently set up buffet area in the middle of the restaurant where they serve their complimentary breakfast buffet. 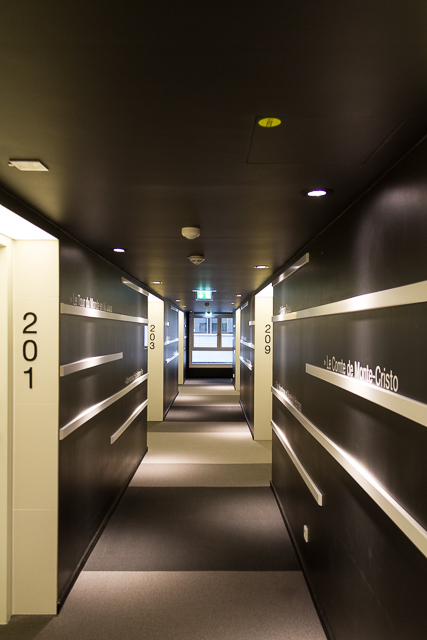 When you get off the elevator you’ll notice that the hallway is very unique and eye-catching. Next to the door to each room there is a novel title printed on the wall and when you enter your room, the literary theme continues. When you lie down on the bed and look up, there is a literary quote printed on the ceiling. The bathrooms are divided into two parts. The sink and toilet are in one part and the entire second part of the bathroom is a large shower. 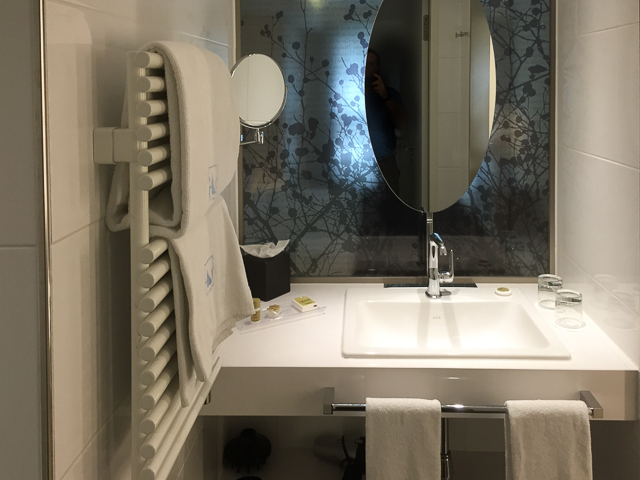 The bathroom was equipped with towel warmers, but does lack counter space. Now while the inside of the hotel is very pretty and very comfortable, the hotel is not in the greatest neighborhood. But if you walk three blocks in any direction, the neighborhood improves dramatically and you’re able to find restaurants or a beer gardens in all directions. We felt comfortable walking around during the day and evening, and noticed many others doing the same thing. About six blocks from the hotel is the pedestrian walkway. Once there we found shopping, restaurants with inside and outside seating, outdoor beer gardens, a farmers market, and we could even go to church if we wanted. 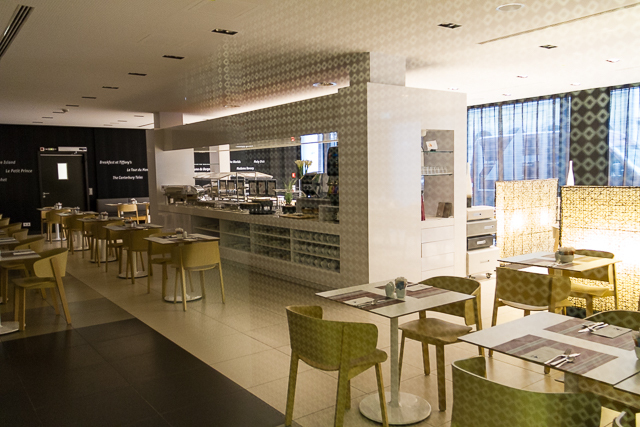 The place is busiest in the afternoon which led us to believe that no one works in Munich after lunch…. they’re all here. 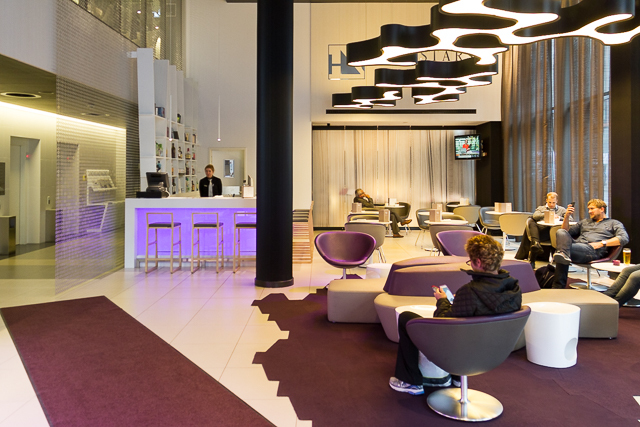 If you’re planning a trip to Munich I would recommend this hotel, but check out the website to make sure this is a hotel that would appeal to you. Take a look at the photos below. Thanks and enjoy. 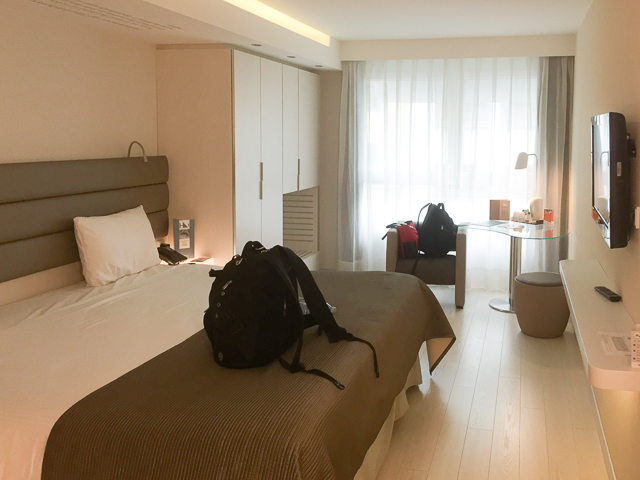 The room view… please excuse my backpack on the bed. I really like the modern design. It makes the hotel look very new and stylish. Thanks for the review!